I highly doubt Mr. Bowie’s most brilliant thoughts came to him while sitting at a desk, but nevertheless, he too had an office. The mystery of where he found his boldness and inspiration is only surpassed by the question of what did he do sitting in his Eames chair at his desk? 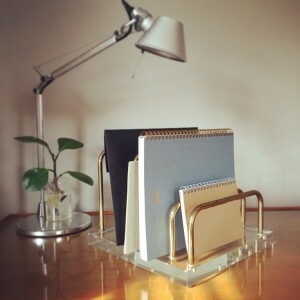 This lucite and brass sorter is one of the only things that has the honor of sitting on my desk. I found it on etsy via Pinterest and was shocked that it hadn’t been snatched up yet! I ordered it, then went down the rabbit hole searching etsy for “vintage office supplies.” This is where you’re going to find scissors that you could benchpress and staplers that will likely last another century. Tired of buying cute stuff that craps out in weeks? Start hunting for office supplies here. Oh, and yes, I did do a post on why I don’t approve of sorters like these, but note that I only use mine to sort blank notecards, notebooks, and my black folder of business receipts. No documents. No scraps. No clutter. Click here to see how film editors and writers are using the trusty, analog index card to layout their ideas. Who says you have to keep your book jackets? 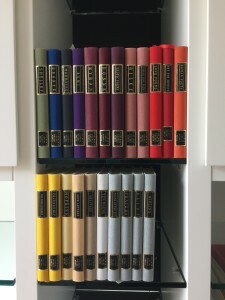 In helping a client with a major book purge, we gave some thought as to how to better display the books she was keeping. It was her brilliant idea to see what the books look like without their jackets. Even though the jackets were beautiful, the bindings look so much cleaner without them! Do you agree? She was confident enough in the decision, so she recycled them. You can certainly save yours though in case you change your mind. Have you done this? Are you willing to try it? Please share in the comments. What Kind of "House" Have You Built Around Your Work? What do tiny cubicles, converted guest rooms, and lofty urban offices all have in common? At the most basic level, they house and influence the work done in that space, for better or worse. This recent Wall Street Journal magazine article further opened my eyes to the impact space has on our work. Let this be an example at the grandest scale. Fashion brand Céline recently occupied and renovated a 17th century Parisian mansion. For starters, the floors make use of 12 types of marble. Marco Gobbetti, Céline's CEO says of the space: “Our project has been about building a house more than a brand. From that point of view, this building represents the foundation and where we come from." Like it or not, your office represents the foundation of where you come from. Even if you don't have (or aspire to have) just one type of marble on your floor, we can all step it up a notch. What will you change, add, or eliminate in your home or office to permeate your work with quality, respect and beauty? Please share in the comments below! Does your office inspire you? Is it beautiful to look at? Or does it have aging washed out Matisse prints on the wall? If so... take a little bit of time (16 minutes) to watch or listen to this interview with my client Michele Theberge. Find Michele at her website here and subscribe to her Youtube channel here. Do you have inspiring artwork in your office space? Let us know below! This, friends, is exactly the type of site that inspires me to live a cleaner, lovelier life - and there's not a single organizing product in site. Take a slow, breezy stroll through Swedish interior designer Lotta Agaton's portfolio here. My extreme kitchen makeover is complete! Proof that Pinterest works! This fall I completed a full renovation of my kitchen, designing it using Pinterest as my sole source of inspiration. This is my first full-on design project and I couldn't be more pleased. Check out my Pinterest Kitchen board and browse the complete set of before/afters. What do you think? I'd love to hear your comments here! What do you think? Would love to hear your feedback!